Polygon Trid ZZ is Polygon's slopestyle bike - tested and developed in collaboration with Sam Reynolds and Kurt Sorge. The custom designed ALX alloy frame features an ultra stiff, 69-degree tapered head tube with a 426mm reach and a low 331mm BB height. A threaded BB, and ultra-low standover means this bike is ready for trickery. The bike comes spec'd with a 100mm RockShox Pike DJ fork and Rockshox Monarch rear shock, SRAM GX DH 7 speed drivetrain and Shimano hydraulic disc brakes. The shifters come standard on the handlebar, however can be easily moved to the downtube if needed. 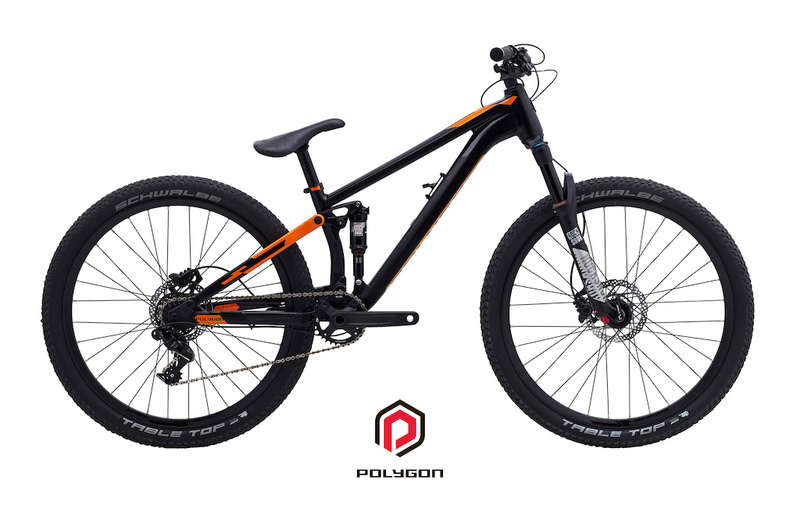 Specially made for Pinkbike readers, coming in a fresh gloss orange on flat black paint job, this bike is not only spec'd for performance, but looks awesome too. On a side note, four bikes mean I'm basically a sponsored rider ???? Haha please do this for every prize! This is the dream for me. I wanna use this bike to 5% of its potential so hard! I can teach you how to manual one parking space. @speed10: Slow it down a little Semenuk. Please, the green text on red has to go. You're hurting people. Agree. This webpage wouldn't work for many colourblind people; in some countries this would actually be illegal under disability legislation. @korev: As someone with pretty severe protanomaly (The most common, red/green colourblindness) I have no problem with the red and green text. The tones/shades are very different so they stand out from each other fine. A darker green would likely be a problem. @Patrick9-32: Hey, I think they changed it! I'm not sure which color they changed (maybe both) but it isn't giving me a headache anymore. Thanks, anonymous Pinkbike webmaster! @Bluefire: I think the green is a little less luminous now. Nice. @Patrick9-32: Ah, no, now I see the real issue. My night filter reddens the screen, making them clash more. They may not have changed it at all. 426mm reach? What is this? A DH bike for ants? WHAT THIS GUY WINS THE BIKE AND THE HELEMT? No it wouldn't. You really don't want rear suspension on the pumptrack. Also, please don't enter. Haha, it would probably make people cry seeing me ride it. What is that elderly man trying to do? I’d scream, and than run around the school screaming, and than the rest of the day I’d randomly break down crying. Please don’t enter, just leave this one to me. O my god!!! It's still the fourth but..ah I mean look at the prize!! This bike would be proud to be ridden by Indonesian people like me huahahaha..come to papa baby..
Lahey says no dirt in park. Was just looking at DJ/slopestyle bikes yesterday. Heard good things about Polygon! F**king hell, is just lucky? so the winner has not been chosen for this slopebike or someone has been chosen? Has the same user won 2 out of 5 so far? Looks like cjewell got the helmet and the bike! I need this one to learn how to bunny hop, so. So get a hard tail and flats. Pinkbike thanks for this chance!! Omg this my dream bike..
Why dream?because in my country the price of trid zz can be used to buy 3 motorbikes...???? do people even enter for the day when they know it's something they just don't want ? Why wouldn't someone want this? It's a sweet slopestyle bike and if you don't like jumps you can sell it. Seems like a win win to me. Haven't entered anything yet. I usually ride my BMX at the pumptrack, got a Specialized P1 dirtjumper too. And my regular mountainbike is low enough to do just fine too. I'll enter when I see something I really want. This one seems to make sense for going really big on slopestyle kind of stuff but to be honest that's not something I'm not into. Totally man. Id be PISSED if i won this. Is there a list of winners for each day thus far? My gosh this is so epic!! ???? My word, I'd love this!!! What an awesome prize! I want this one badly!!! I want that one so bad! Trek Ticket S slopestyle bike..... so many carbon copies these days. Complete bike Trid ZZ $2000 compared to trek?